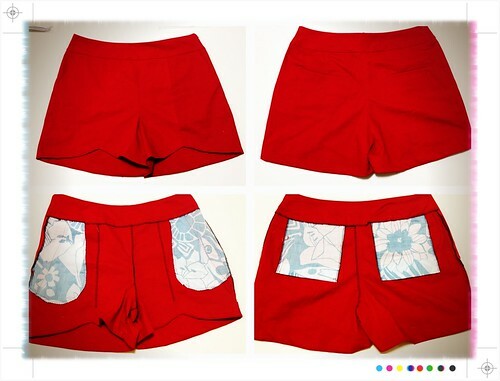 I first saw these made by Dixie DIY at my local sewing meetup, and I just fell in L-o-V-E with them. It was right in the middle of the Texas summer and I NEEDED some shorts. 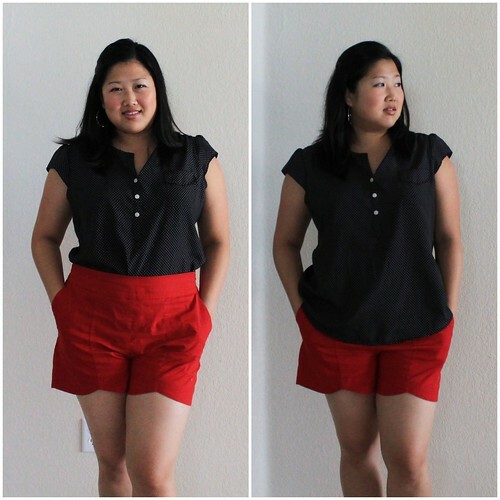 What's not to love about them... they're shorts (not too short or too long) with pockets and a scalloped front hem and are fairly easy to make! <3: again... love the DeSiGN! I also love the lining fabric, which was from my scrap box, I used for the pockets. The instructions for the welt pockets are super confusing. I had a very difficult time following them and just kept re-reading and re-doing it and it eventually worked. Other than that, the rest of the shorts went together very easily. The waistband is a little too big. I realized that I need to take it in at least an inch. I'm wondering if this is due to my fabric having some stretch... but it is interfaced? I also realized that in general I don't like side zip shorts (or pants, but more on this in a different post), but these will still get a lot of wear. Overall: Easy, cute pattern that I might have to make again in the future to wear for the fall/winter especially after seeing paunnet's version. I would recommend it to others... just need to find a different welt pocket tutorial. Maybe this one?